Faraway Press: The Online Home of John Jackson Miller: New Battlestar Galactica comic launches in October! 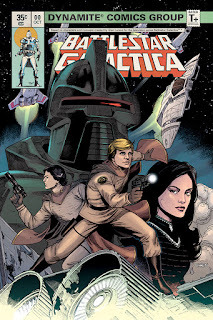 New Battlestar Galactica comic launches in October! So began the opening to Battlestar Galactica, which debuted 40 years ago this month on ABC. I was one of the kids in the audience that night — and every week that followed that season. So I was delighted when Dynamite Comics tapped me to write a comics miniseries for this fall, focusing on the original cast. — priced at 35¢, just as the first Marvel comics issue was, way back then. The art is by the wonderful DanielHDR, who's wowed me with his versions of the characters and ships. There are multiple variants of the zero issue, as for #1. Subtitled Counterstrike, the series brings the Galactica's fleet into contact with something they've never encountered before — another ragtag fugitive fleet, much like theirs. Can they make common cause against the Cylons? You can read more about the series here and here — and find the zero issue at your comic shop on October 3. The series then continues monthly thereafter. I've been tremendously busy writing this summer, hence the relative radio silence here on the blog; but I do have behind-the-scenes notes up for the Star Wars Adventures Annual 2018, released earlier this year.